Don’t let your OKRs turn into New Year’s resolutions. You have to make them part of the work routine of each team by using the Weekly OKR Tracking Check-ins. The Check-in is a short ceremony for tracking results. The idea is not to increase the managerial overhead or to add more meetings but to make existing meetings more productive and even to merge or eliminate some of them. Check-ins should happen every week. Having monthly meetings to track results is intuitive when you have annual goals, but since you are using quarterly OKRs, you should also have more frequent Check-ins. They should be short and limited to one hour or less. I have worked with dozens of executive teams, and they all managed to keep it under one hour – usually around 30 to 40 minutes. Teams check-ins tend to be shorter, with some teams doing 15-minute stand-up Check-ins. Weekly Check-ins are probably the most powerful tool to make OKR tracking a part of the company culture. Improving OKRs vs. putting out fires: Several teams have regular staff meetings, but they are usually dedicated to putting out fires and not on improving results. The Check-in reverses that: we will begin by measuring our OKRs. 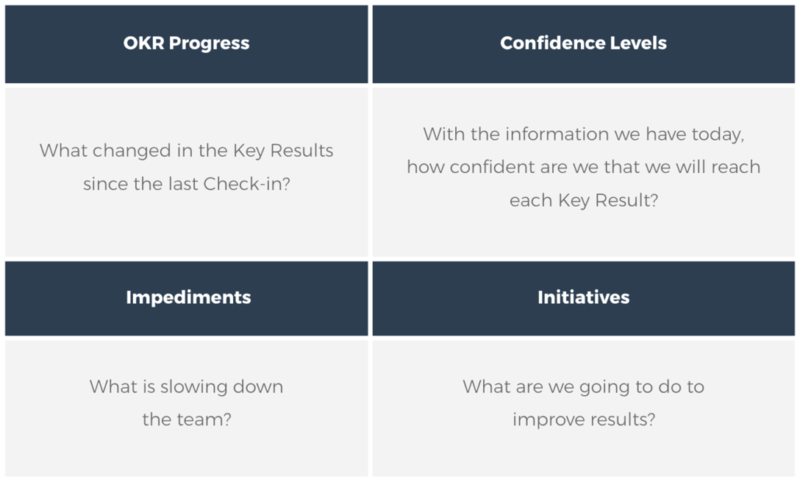 Focused on improving results and not on giving excuses: The Check-in should be about how we are going to improve our OKRs and not about listing all the explanations for the disappointing results that may eventually occur. A common approach to OKR tracking includes the practice of scoring, where you give grades to each Key Result at the end of the quarter. Scores usually range between 0 and 1.0, with expected values being around 0.6 and 0.7 in average. By defining OKRs at the beginning of the quarter and scoring them only at the end, you are setting yourself for failure. Without a regular cadence of measurement and follow-through, the numbers will not improve. The Check-ins create that. Most teams find the scoring process to be confusing since it can be extremely subjective (“What is a 0.5?”). If you define the scores in advance, meaning you agree in the beginning of the quarter on what is a 0.3, a 0.7, and so on, you will increase complexity by 3x to 5x. For each Key Result, you will have to set three to five achievement levels, which is not a recipe for simplicity. Scoring brings almost no benefits if you are using Value-based Key Results. That is why my recommendation is: forget scoring. Use Value-based Key Results and just measure them. It will be simpler for the teams, and it will drastically reduce the time spent setting OKRs. The Check-in starts with data. What is the current measure of that Key Result? What changed since the last Check-in? If the OKR progress is the quantitative aspect of the Check-in, the confidence levels bring the qualitative aspect. What is not in the data? For example, is there an important initiative running late or a key client about to cancel? Maybe one of our hypotheses has been invalidated? To set the confidence level, the team has to answer the following question: Considering the information we have today, how confident are we that we will reach each KR? What matters is the conversation: all members of the team should discuss them. The confidence levels are an excellent alignment technique that will also allow you to assess the engagement of each team member quickly. Red (or “sad”) does not mean the team should give up. It says the team should change their approach. What is slowing the team? Is there an external factor that, if solved, could improve results? For example, does the team need better tools or is an initiative from another team delayed? What are we going to do to improve results?